These mages are all about attacking with spells and doing lots of damage with them. Typically these mages will be users of most if not all types of Elemental Powers (one element is not unheard of, though), with Fire, Ice, Lightning being particularly common, and may fall under Linear Warriors, Quadratic Wizards. They do not heal (or only have minor healing spells) and typically pack Area of Effect spells in their arsenal. Very frequently Dark Is Not Evil. The term comes from JRPGs, particularly the Final Fantasy series, and is in stark contrast with its meaning in European tradition which is "a user of evil magic". Black Magician Girl and Lady of Black Magic are subtropes and are often paired up with The Medic, White Mage, or White Magician Girl as a Foil. Specifically paired with a White Mage it's Black and White Magic. Often overlaps with Squishy Wizard and Glass Cannon. Contrast The Medic and White Mage (the defensive or remedial equivalent). Not to be confused with Black Magic (which is outright evil rather than merely destructive) or the character Black Mage Evilwizardington (though he is an example of both tropes). In Delicious in Dungeon, Marcille's magic is combat oriented and explosive. But, she also knows healing and revival magic as well. It's hard to say if she's more of The Red Mage, or if healing magic is just more common in this world. There's also the Lunatic Magician, who wields extremely powerful and destructive black magic. Mahou Sensei Negima! : there are two classes of normal mages. A "Wizard" focuses on attack magic while others protect, whereas a "Magic Knight" fights up front and uses spells. Negi chose the latter, but Yue has chosen the "Wizard" style complete with the Final Fantasy style Black Mage outfit. Although Kagura from Inuyasha has shown herself to be very fit physically (being a demon, it comes naturally for her), she always fights using wind-using spells and magic. She also has no issues cutting up your best friend and then turning them into a zombie to lure you into an ambush. In the .hack//Legend of the Twilight anime and manga. Hotaru would be the battle mage of the group, except she's afraid to hurt the monsters. Fatina, from The Tower of Druaga: The Aegis of Uruk. She uses a large staff that resembles a cannon for nuking things with her fire magic. While her bubbly and polite personality is perhaps more in line with a White Magician Girl, Magical Circle Guru-Guru's Kukuri dresses in black and uses demon summoning magic. In Slayers, black mages (like Lina and her sometime-sidekick Naga) are specifically wizards who call on Mazoku for their spells; both they and shamans (like Zelgadiss) can get very, very destructive effects. In fact, many "elementally offensive" spells, like the classic Fireball, are shared by both forms of magic. Hayate Yagami of the Lyrical Nanoha franchise, who as the Queen of the Night Sky, comes with the widest variety of nuke-level offensive spells in the cast. These range from releasing city-wide spheres of darkness to creating massive icebergs that dwarf space ships. Yu-Gi-Oh! has the Dark Magician. An excellent example of Dark Is Not Evil, as he fights to protect Yugi, and in his previous life, he was a priest who (Mahad, who sacrificed his own ba (life force) so he can fuse with his Illusion Magician) sacrificed his life for the Pharaoh. One Piece gives us Nami, who, through her Clima-Tact, can control weather in such a way that it's similar to her casting elemental spells. While lightning is her specialty, she's also more than able to utilize every element in nature to good effect when she needs to. In Supergirl story Demon Spawn the titular heroine fights Nightflame, a sword-wielding sorcerer who can open dimensional portals, use fire-spells, fly and steal souls. Since Supergirl is vulnerable to magic, it is not an easy battle for her. Trisana Chandler from Tamora Pierce's Circle of Magic. This is actually a downside of winning the Superpower Lottery: Her extremely powerful weather magic (where "weather" also includes natural disasters) would put her in high demand as a war mage, but she'd prefer to be a healer, something which she's simply too strong for. To paraphrase, "it would be like performing surgery with a mallet." All four kids, and some of their students, can put their magic to spectacular offensive use when they need to, though Tris is the most naturally suited to it. The Saga Of Recluce inverts this and White Mage; those who use order magic (which can improve health, speed healing, and strengthen and protect) are called black mages, while those who use chaos magic (which is, as the name implies, very destructive) are the white mages. On the grand scale, however, the black mages have easily the greatest destructive potential because they can manipulate weather patterns, which makes the nation of Recluce with its numerous black mages a (highly resented) world power. The Green Aes Sedai are known as the "Battle Ajah." In the final book, they are on the front lines of the Last Battle. Ashaman are trained to think of themselves as weapons first, and men second. There are a few who learn healing spells, but they're generally the exception. They also notably wear black uniforms, and live in a fort called The Black Tower. It is implied by some of Tuon's actions and dialogue that Damane don't learn Healing, and would not be trusted to use it, if they did know it. They are kept on leashes, and outright referred to as weapons. The BBC/Starz series The White Queen portrays Elizabeth Woodville, queen consort to Edward IV, as a witch with actual supernatural powers. Throughout the series, she is able to call down terrible thunderstorms on her enemies at strategically critical moments, cause her enemies' deaths through magical curses, and otherwise wreck terrible destruction with her magic. When her husband, King Edward, lies dying of a fever, another character, Margaret Beaufort, says that the king will be fine because the queen will just brew some magic potion to heal him. Needless to say, that is not one of Elizabeth's powers, and Edward dies. That being said, Elizabeth (and her mother and her eldest daughter, also portrayed as witches) are shown to have some non-offensive powers, including divination magic; also, Elizabeth did use her magic to make Edward fall in love with her in the first place, or at least to help the process along. Still, it would appear that the Woodville women in this show are at least partial examples of this trope. Norwegian black metal band Emperor take this literally in one of their most well-known songs, I am the Black Wizards . This is also the title of the song Чёрный маг , by Russian band Epidemia. The Forgotten Realms setting has the Cormyrean War Wizards, masters of combat magic, who have made it as both a 3.x edition Prestige Class and a 4th edition paragon path. The 2nd Edition Complete Wizards Handbook had the militant wizard kit, which concentrates on offensive spells. The 3.5 Complete Arcane and Miniatures Handbook Sourcebooks both featured the Warmage class, which is this trope to the exclusion of everything else. Evokers, specialists in the Evocation school of magic, tend to take this role in general, as Evocation is focused on manipulating and discharging all kinds of elemental energy - Fire, Ice, Lightning is perhaps iconic, but they can also wield acid, poison, and other elemental types depending on edition. This makes Evokers generally fall under the Person of Mass Destruction archetype, as their school's singular trick amounts to different flavors of "blast the hell out of everything around you". In 4th edition, this became the defining niche of the Sorcerer. Whilst wizards could still throw around plenty of elemental attack spells, they were a "Controller" type class and focused more on winnowing out minions and otherwise manipulating the battlefield. Sorcerers, in comparison, were a "Striker" class; they specialize in picking one target (or a small cluster of targets; Sorcerers are unique amongst Strikers in their focus on small area-of-effect attacks) and killing it quickly with a lot of elemental damage. The Warlock class tends to specialize in damage-dealing spells with a comparatively small arsenal of non-lethal tricks, and is mechanically quite close to the Black Mage archetype. Flavor-wise, they're close to the other kind of black mage, as warlock powers generally stem from a Deal with the Devil (or The Fair Folk, or an Eldritch Abomination). Spheres of Power: Any mid- to full-caster with a focus in the Destruction sphere. Vampire: The Masquerade generally avoided this (overt magic use being a breach of The Masquerade), but there were still a couple paths of Blood Sorcery based around massive eruptions of magical energies, such as Path of the Levinbolt, Lure of the Flames, The Fires of the Inferno, and the incredibly fun Koldunic Way of Fire. The magic-focused World of Darkness property, Mage, has the forces sphere, which is all about throwing around elemental forces that are increasingly destructive, blatant, and generally terrifying. Low levels start out with redirecting natural fire and electricity into damaging effects, and increasing mastery gives the caster the ability to grab increasingly fundamental physical forces like gravity and radiation and use them to blow things up. Even non-damaging uses of the sphere like flight and invisibility are usually so blatantly supernatural that spell backfire is going to do something dramatic and damaging anyhow. Because their effects are generally ignored by people to begin with, a lot of changeling powers also fall into this category in the New World of Darkness edition. Elemental ones, obviously, but many goblin contracts fall into this category too, doing things like dropping the wild hunt into a scene at random. Magic: The Gathering: Instant and sorcery focused decks tend to function this way, as opposed to the Summon Magic of creature-based ones. Red is your go-to colour for this, since it's the colour of "kill it with direct magical damage", with maybe a bit of blue mixed in for card draw, instant/sorcery recursion and the occasional counterspell. Black can do okay, with a lot of effects that instantly kill creatures or drain life from the opponent, but the other two colours tend to be much more focused on summoning and as a result rarely have a place in this kind of deck. Of course, virtually every red-aligned mage will have direct "kill it with fire/lightning" spells, but a lot of the time they're used to open up a hole for the monsters to go through and occasionally as a finisher, rather than being the be-all and end-all of the player's strategy. Ammo: Almost every player character that knows magic at creation will use an offensive spell (Air, Water, Earth or Fire). Learning more elements later is helpful because of Elemental RockPaperScissors being in effect. The fifth option is Life that, while loved by the team, is serious crap for the character himself. ALL demons that know magic will spam elemental attacks like rain at a funeral. The 4th edition Champions supplement Mystic Masters makes the observation that superhero comic book wizards in general usually lean in this direction, since what we'll typically see them do most prominently with their magic is fight while at the same time healing or regeneration magic is (barring dedicated healers, who then in turn tend not to fare too well in combat on their own) noticeably not much in evidence in their personal arsenal. It consequently advises keeping that convention in mind if one wants one's game to feel like the comics themselves. The Bright College of Wizardry in both Warhammer and Warhammer Fantasy Roleplay. The other seven schools all have some kind of offensive magics but also include things like healing, illusions, or prophecy. The Bright College wields the Lore of Fire; of its seven spells, six can be summarised as "set your enemies on fire and watch them burn". And the seventh is "set your allies' weapons on fire so that they can set your enemies on fire". Ars Magica: Of the twelve Houses in the Order of Hermes Magical Society, House Flambeau focuses on honing offensive magic. Playing with Fire is their signature skill, but many also train in the perdo magical Form, which can degrade or destroy any sort of target — bodies, substances, minds, or magic itself. While the House considers itself the Order's equivalent of Knights and have established a code of chivalry to match, other Houses tend to find them a bit overenthusiastic in that respect. Final Fantasy is the Trope Namer and possibly Trope Maker. Black mages are a staple class in the series, appearing in almost all of the games. Final Fantasy III also has the Magus job, which functions as a stronger version of the Black Mage job. Final Fantasy IV has Palom (in contrast to his twin Porom), who is from Mysidia, a town full of mages. Rydia also possesses black magic, though she primarily focuses on Summon Magic. Black Mage is one of the first jobs obtained in Final Fantasy V.
Black Mages are an entire race in Final Fantasy IX. 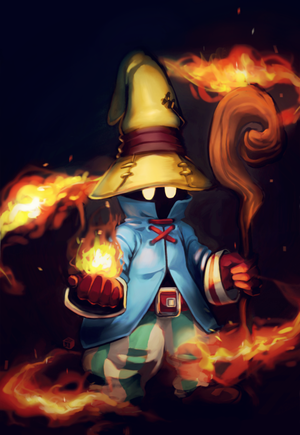 One of your party members, Vivi, is a black mage. In Final Fantasy X, Wakka even refers to Lulu as a Black Mage in one of the tutorial fights. Final Fantasy X-2 has the Black Mage dressphere. Final Fantasy XIV has the Thaumaturge Class, which can unlock the Black Mage Job. Mages fulfill this role. No self healing while nuking from a distance. Destruction Warlocks are all about throwing hellfire at things until they fall down. The Dragon Quest series is fond of this trope. In Dragon Quest III, the Wizard class specializes in casting destructive spells. In Dragon Quest IV, Both Maya and Borya fit this. In Dragon Quest VIII, Jessica fulfills this role till late in the game when she gains pretty decent healing spells. In Dragon Quest IX, the Mage class has all attack magic with a few debuffing spells overshadowed by the Sage class which has both better attack spells and gets healing spells, though the mage gets better stat growth for casting offensive spells. Disgaea has both male and female magic users (they're coloured differently according to element). They learn spells of increasing power and area of effect that deal damage within their element (so fire mages learn fire, mega fire, etc; ice mages learn ice, mega ice, etc and so on). The highest level mages can learn most of all the elemental spells, but cannot master the strongest spells of each type. Most wizards and magicians are expected to be specialized in incredibly powerful magic. Their main drawback is that, while powerful, they're not much stronger than a normal human, taking them into Glass Cannon territory most of the time. In fact, it is implied that the reason Marisa can beat the crap out of supernatural entities and gods on a regular basis (even outside of Spell Card duels) is because she is just that damn good at casting spells while not having her head vaporized/blown/burned/etc. All because she studies her magic very carefully. They both use damaging spells and for the most part perform no healing or support spells. The Wizard branch uses area spells with special effects like a chance of stun or freezing and the Sage branch can cast two streams of bolt spells at once with Double Cast as well as endow weapons with an element to increase weapon damage. In Recettear: An Item Shop's Tale there's Calliou, the Squishy Wizard who has a grand total of one utility spell, with the rest being solely for offense and no melee combat ability whatsoever. To a lesser extent there's also Arma, who's later weapons are pretty much Magitek WMDs. Shadow Era's Mage Heroes (both Human and Shadow) are this. La Tale has the Sorcerer class, one of the two advanced classes after Wizard, which abandons all healing magic for pure offensive magic. Imoen from the Baldur's Gate series, a friendly and upbeat sort who starts out as a thief in the first game but then becomes a black mage. Rune from Phantasy Star IV is a full-on 'blast everything until it dies' type, whereas Kyra is a warm and friendly sort who appoints herself Cool Big Sis to the hero but can still blast things (and heal a bit). Star Ocean: The Last Hope gives us Lymle and Myuria. Star Ocean has Ronyx, who is the only caster not to learn any healing magic and also the only one who can cast Dark element spells. Angela of Seiken Densetsu 3, right down to the weapon and personality. Genis Sage from Tales of Symphonia. Jade Curtiss from Tales of the Abyss. Ana from Earthbound Beginnings and Paula from EarthBound: They both use offensive spells such as PK Fire and PK Freeze (Ana also has PK Beam). Kumatora from MOTHER 3 also fits. Gwen, an NPC in Guild Wars, is first encountered as a happy-go-lucky little girl who befriends the player in an idyllic countryside. Fast-forward eight years of game time, and she's a powerful Mesmer described as being driven primarily by hatred and anger. Cierra in Riviera: The Promised Land. Chelsea from Bunny Must Die! Chelsea and the 7 Devils. Also, Gil/Magil from Radical Dreamers and Guile from Chrono Cross. Whether these three people are one and the same is another matter entirely. Dragon Age: Origins: although you have freedom to spec her as you wish, Morrigan starts off as a Black Mage as well. It's also possible to turn the player character, The Warden and Hawke, into Black Mages as well in both games. Dragon Age II: Merrill, who despite being much nicer than Morrigan, practices Blood Magic which is considered one of the most dangerous forms of magic, and has no healing magic other than using said blood magic to steal others' life force for herself. This is the role of the Rift Mage specialization in Dragon Age: Inquisition, which maximizes offensive ability. Throughout the series, masters of the Destruction school of magic are the Black Mages of the setting. The elemental spells of the Fire, Ice, Lightning trio are classed here, as are spells which make opponents weaker to those elements. Depending on the game, generic non-elemental "damage health" spells may also be classed here, as well as poison-based spells. In Morrowind, the Master Trainer in Destruction magic isn't a high-ranking official in the Mages Guild, or even an ancient Great House Telvanni mage-lord...it is a little Breton farmer by the name of Leles Birian. She can train you to a higher level in the Destruction skill than anyone else in the entire game. Delphine Jend, a sweet little woman who likes to kill cute woodland creatures with Expert-Level destruction spells. And the Master Destruction magic trainer Bralsa Andaren, who is actually out doing said killing of woodland creatures. Bonus in that she's also a gray-skinned Dunmer (Dark Elf). The Sorceress in Diablo II, who focuses entirely in Fire, Ice, Lightning offensive spells. Breath of Fire I and Breath of Fire II give us Deis/Bleu, the nagaesque Person of Mass Destruction. Nina as well, with the exception of the first game. Sira of Albion. Her spells are destructive (coming dangerously close to becoming an instant 'I Win' button), but she's rather gentle and friendly. The spells themselves are also nature related as she conjures thorns, fungi, and ice splinters that grow like flowers. Khunag also qualifies, if not more so. His spells are all about dealing damage, with only a couple of exceptions that seem like an afterthought. Donald Duck is somewhere between this and The Red Mage in the Kingdom Hearts series: his starting staff even resembles the classic Final Fantasy Black Mage. The Magic Knight hero Sora's spells tend to pack more of a punch, though. Mallow from Super Mario RPG is another "somewhere between this and The Red Mage" example, and like Donald, his appearance borrows elements from the Final Fantasy Black Mage (in Mallow's case, the striped pants). He gets an early healing spell, but that gets eclipsed once Princess Toadstool joins you, and his specialty is in combat magic and rounding out the party's Elemental RockPaperScissors with Mario (between the two of them you can take advantage of every elemental weakness in the game). Adepts in the Mass Effect series focus on devastating and disabling enemies using biotic powers. Recurring squadmate Liara T'Soni is a prominent Adept, with Jack in Mass Effect 2 also qualifying. At the beginning of Duel Savior Destiny Lily is the strongest member of the Savior class, but she looks down on healing magic as worthless. This really comes back to bite her in the fifth chapter when the regular healer is incapacitated and she can't heal her or the other injured people, thus forcing what remains of your party to retreat, apart from Rico. Apparently, it's actually rare to see mages who specialize to this extent in pure combat and within a few more chapters she has begun picking up standard healing spells. The elemental magic skill tree in The Secret World is dedicated primarily to blasting anything and everything into little pieces. Not that the other skill trees don't have perfectly viable means of damage-dealing, either, but they're often a little more diversified. Elementalism is classic Black Mage material. Though her mode of dress resembles something else, this is Rita's role in Tales of Vesperia. Nico Minoru is this in Marvel: Avengers Alliance — most of her spells have various debuffing effects and her strongest offensive attack takes advantage of enemies being given a lot of debuffs first. Lester Deth in Charlie Murder combines this with Summoning Magic. The Fire Emblem series has the Anima mage class, sometimes simply called the "Mage" class. Anima mages specialize in the three Elemental Magic types (called "Anima magic" in a few games) in the series: Fire, Wind, and Thunder. Anima mages most often promote into the "Sage" class when at a sufficient level, and gain the ability to use healing staves alongside damaging tomes. Dark Elf Warlocks in Heroes Of Might And Magic V specialize in Destructive Magic, and their racial abilities are aimed at enhancing its damage, lowering the enemy's resistance to it, and replenishing mana quickly. Black Mage from 8-Bit Theater, naturally. Parodies his character class, just like his teammates—he has several incredibly destructive spells, but rarely uses anything other than his once-per-day hadoken, and just as rarely manages to actually hit something with it. His real weapon of choice is his seemingly endless supply of daggers, mostly used for stabbing his teammates when they do something annoying. Ariel from Drowtales, though she prefers shapeshifting to her offensive spells. Richard from Looking for Group is as black as they come, and deadlier than he is dead. On the subject of liches, Xykon. Other than the occasional hold spell, he tends to leave all non-hurty spellcasting to menials. Vaarsuvius was initially this, mostly going for powerful and destructive spells like Fireball. However, after a brief stint as evil, a chat with Xykon of all people, and a Heroic BSoD, V is trying to be a little more rounded, creative, and strategic, and use support spells more. It was off to a rocky start, but helped with the return of Zz'dtri.